It can be difficult to find the Livia in stores, which is why we recommend shopping online. And don’t forget to check if you’re eligible for free shipping with an Amazon Prime membership. Find it here: Get the Livia on Amazon. Perhaps the real question is, “Does Livia work?” Keep on reading to find out! 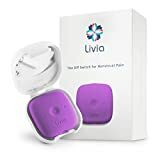 How to Stop Period Cramps: Consider the Livia Device? If you have bad cramps, you’re probably willing to do almost anything to get rid of them. You may have tried exercise to get rid of cramps, or other natural menstrual cramp cures. Maybe you just pop painkillers like they’re vitamins! If you’re reading this article, those natural remedies probably didn’t work for you, and you probably don’t love popping painkillers because it can be pretty hard on the body. If you have want to stop period cramps, you could consider this device. It’s a device that’s similar to the TENS unit you might use when you visit the physiotherapist. It’s basically a machine that transmits electrical impulses to your abdominal area. You place the pads where the pain is (abdomen, or lower back), plug the cord into the unit and turn it on to start emitting electrical impulses. The company claims that it blocks period cramps, simple as that. We’re going to take a look at what the science says, what actual user are saying about the product and then weigh the pros and cons of this new machine in the feminine hygiene world. We’ll then give you our recommendation on whether or not you should consider this interesting, new product. The best place to get it is on Amazon. Shipping is usually free, it’s always quick and the packaging is discrete. If you want to reduce pain, then consider this machine. The Livia came out in 2016 after a successful Indigogo campaign, which raised almost two million USD. There was a lot of buzz surrounding the release, and information about the Livia could be found in places such as the Huffington Post, Cosmopolitan, Seventeen, and Bustle. However, it’s not exactly new technology, despite all the hype. People in the health and medical field have been using nerve stimulation for decades to reduce pain. It has been approved for sale in the USA by the FDA, although this doesn’t tend to say much about whether or not the product actually works. Let’s explore what the science behind menstrual cramp pain says, this product specifically and then what actual users are saying over on Amazon. Relief from Painful Periods: What do the Studies Show? The TENS machine, which you’ve probably seen when going for physio has been around since the 1960’s and is used to treat pain by electric nerve stimulation. The Livia is quite similar, although it emits a specific frequency which is particularly useful for menstrual cramps. The Livia conducted clinical trials with 163 people, and it was found to reduce menstrual cramps by 80%. Studies have also been done to see if regular TENS machines are effective at treating menstrual pain. The results showed were very positive. 42% of people using the TENS machine reported good, or excellent relief from pain. Compare this to 3.2% of people who used the placebo (fake) TENS machine, which actually didn’t emit electrical impulses. Overall, the clinical research undertaken by Livia, as well as this study about the TENS machine and period cramps are quite promising. It does appear that the Livia could actually work at reducing pain during your period. Includes everything you need to get started, including device, cover, USD charging cover, travel case, pads, etc. Isn’t it Basically a TENS Machine? Oh, don’t forget about the cute colours too! The Livia is obviously a machine made with women in mind. However, in our opinion, this certainly does not make it worth the much higher price-tag. If you get some terrible period cramps and pain and are looking for some relief, then you might want to consider getting a TENS. Studies have shown that they are able to offer relief for many people. But, should you consider the Livia for period pain? Possibly, yes. It is a device that has worked for many people. And if it works for you, then all the power to you! It’s well-made, and includes everything you need to get started with reducing your cramps. The electrical pulses will hopefully help reduce pain during your period. However, it does not appear that there is any difference between a regular TENS unit, and the Livia, except for price and colours. The Livia is cute, and obviously designed for women in mind. It is, however, very expensive when you consider what you’re actually getting. If you get the Livia, you’d probably be pretty happy with it. However, if you’d like to save a bit of cash, then check out the chart above for some of the cheaper options for menstrual pain. In terms of effectiveness, they’ll work just as well. Livia Gel Pads: Can I Get Replacements? If you use your Livia frequently, you may want some additional pads because they can become worn out. However, in our experience, they are actually quite durable so we don’t suggest buying additional ones until the time arises. Have you ever heard of the Livia Machine before? Many people haven’t! It’s in fact on our list of the Menstrual Products You’ve Never Heard Of. What do you think about the Livia? Does it really work? Or, is it a lot of hype. Leave a comment below and share your thoughts with us. Also be sure to give this content a share on Facebook, Twitter, or Pinterest. « Aneer Menstrual Cup Review: Is it the Right One For You?